Seeing as I'm not doing anything right now, I'm going to start uploading the rest of the cars that I've created or collaborated on with Mladen007 since I stopped uploading things here last year to get up to speed again. I will be uploading one car per day until they're all done, these were all exclusive to my website, which is currently undergoing a change and thus unavaliable for now, so grab 'em while they're hot. This has been a long time awaiting to be released. It's the first proper RC car I've actually made for RV. Shock! Wow! I actually made an ACTUAL RC CAR. ...Anyway, there were many ups and downs this car went through before finally getting released. Having to deal with the axles, scaling and the final testing. The feedback I was given said that the car was too big and needed a few adjustments, but considering that it's around the same size as Bigvolt and Bossvolt, albeit possibly a bit wider, I'm just going to release it as is. I tried to make it fit in and balanced the parameters with the other stock cars as best I could. It has very quick acceleration and a middling top speed to compensate for it's large size. Rather suited for jumps and stunts, I just hope that it actually lives up to the expectation. Feel free to repaint it and whatnot and, as always, enjoy it! 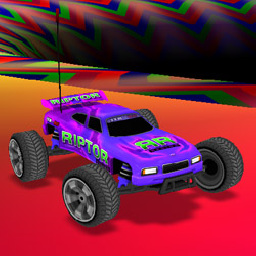 The original model & textures were created for the WiiWare game 'Stunt Cars' by BrightRetro. It was converted into RV by Marv. Because no-one seems to know what a readme is anymore, the track in the picture is Slippery Slope by Killer Wheels.